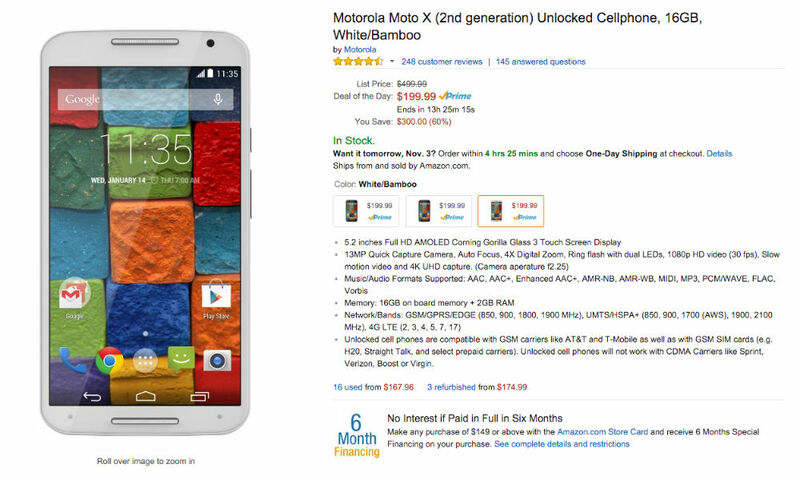 For those in need of a good deal, you can grab a Moto X (2nd Gen) on Amazon for just $199. There are currently three options available to purchase – 16GB with Black Leather back, 16GB with Black Soft Touch back, and 16GB White front with Bamboo wood back. The devices are new, meaning you won’t open the box to find a used, refurbished phone inside. Each model available is Unlocked, so they will work just fine AT&T and T-Mobile networks. As for the $199 price, it’s not bad for a phone that we declared was Phone of the Year in 2014. It features a solid 5.2″ AMOLED display, Snapdragon 801 processor, 2GB of RAM, 13MP rear-facing camera, and 2,300mAh battery. One thing to note, these models do not appear to be “Pure Editions,” meaning they could be unlocked AT&T models. If this is the case, you may not see an update for Marshmallow, as Motorola has yet to announce plans to update carrier branded models of the Moto X (2nd Gen). Follow the link below if you are interested in picking one up.